We get ourselves into trouble when we expect direct, visible growth. I had lofty expectations for spiritual growth during my time at Clemson. Aside from a few national championships in football, I anticipated drawing closer to Jesus, finding a community, and discovering clarity in my future: namely an aspiration for ministry. Yet the only clarity I found was that I, for whatever reason, was not written into God’s plan. I wrestled with doubt and begged God to relieve me of the burden of constant questioning. The response I heard was not a powerful or even a polite refusal—I heard nothing. Absolutely nothing. I was depressed, I felt abandoned, and quite honestly I felt a bit pissed off. To me it seemed as if God had been leading me by the hand to a life of ministry and then just left me, cold and alone. Even worse, I would resent friends who were growing closer to Jesus because I was jealous that, metaphorically, Jesus had taken them by the hand while leaving me lost and looking. I felt like a lost, wandering, meaningless orphan. And worse yet, Clemson went 6-7, in as much of a tailspin as I was. In Psalm 13, David wrote those words to God. They felt like they had come on a telegram from my soul. I understood why God wasn’t felt by those who refused to seek him, but I was actually trying to seek Him. I was pleading God to remember me and show Himself to me. But I detected no response. I’ll never claim to know the Will of God, but I do believe there was value in the suffering. Romans 5:3-5 says that ‘suffering produces perseverance; perseverance, character; and character, hope.’ And it was true. After two and a half years of desperation and perceived isolation from God, I could feel his hand and hope again. But that’s all it was all along – a perceived isolation from God. He was no less with me after the storm than he was in my darkness. He was no less with me when I only bothered to pray once a month then when I prayed daily. He was there, regardless of what I did or how I felt or who I felt. Through it all I learned not to base my perception of Jesus’ closeness and compassion on something so untrustworthy as emotions and feelings. A recent adventure into Scripture has left me wrestling with God. It’s a story I’ve probably read a hundred times. And yet, somehow the questions I’m asking about this passage never entered my consciousness the first 99 times I read it. Only after Jesus senses that the teachers of the law are making an inward fuss about His open display of authority does He say to the paralyzed man, “Get up, take your mat and go home,” thus healing the man of his paralysis. I guess the question that troubles me is this: If the teachers of the law hadn’t questioned Jesus’ authority, would Jesus have healed the man’s legs at all? Could this story have ended with Jesus walking away from the man after forgiving his sins while leaving his legs paralyzed? In all honesty, I have not come to a solid conclusion regarding the tension I find in this text. It still doesn’t entirely settle. The one thing that has become clear to me as I read, however, is my own short-sightedness and small-mindedness. I entered this passage wanting from Jesus an immediately gratifying result. Please, Jesus, heal this poor guy’s legs. But, surprise, surprise, Jesus doesn’t conform His ways to meet my expectations. I wonder if this man’s request was too small. The paralyzed man wanted his legs healed, but Jesus wanted the whole person healed. The paralyzed man wanted the freedom to walk, but Jesus wanted to give him freedom from the weight of sin. The paralyzed man wanted healing from the physical sickness he could see, but Jesus wanted to heal him from the spiritual sickness he could not see. I often hear people talk about how we need to hold things in tension when it comes to faith. I don’t think I have ever understood that better than on July 4, 2008. That day, I was in Corinth, Greece. It was not any of Paul’s words to the Corinthians that moved me to deeper understanding of Truth, but a jump at the Corinth Canal. 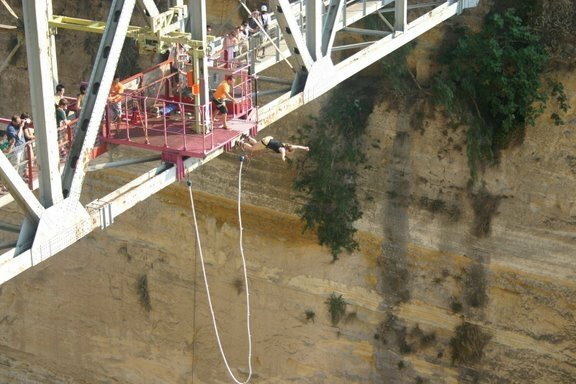 I was not expecting to bungee jump that day, but something inside me told me it was an experience I just couldn’t pass up. Something else inside me, though, kept reminding me that something could definitely go wrong when you’re jumping off of a bridge 150 feet above the water. What I was holding in tension was my faith in the rope and the people who understood the rope versus my doubts that everything would go well and I would return home unharmed. How did I test that? I jumped.This is not an analogy where the rope is a metaphor for God. God is much more reliable than a bungee cord. But, because I was afraid that the jump could lead to death or injury, I was doubtful and I was forced to hold doubt and faith in tension. I can’t, however, stand on the edge forever, endlessly weighing which side of my brain I trusted more. When I experience deep pain or witness extreme injustice, I certainly find myself doubting a faithful God. There was a time when I would recognize that doubt and determine that I must not have enough faith. Now, though, I understand that true faith does not come without doubt. If I think I have faith without doubt, then I don’t have faith at all – I have certainty. But we are called to faith, and ultimately, that faith must lead us to “jump.” Trust me, it would have been a lot easier to take the plunge in Corinth from a place of certainty, but it was weighing all the doubts in my mind that made it a leap of faith.